The Beckett Irish dancers were put together by Matters Musical and Paul Kerr the leader of the Beckett Irish band for a large-scale corporate event in the summer of 2005. The troupe consists of both male and female Irish dancers. The brief was to come up with a team of young Irish dancers who could perform in a contemporary style, ie post Riverdance and Lord Of The Dance. 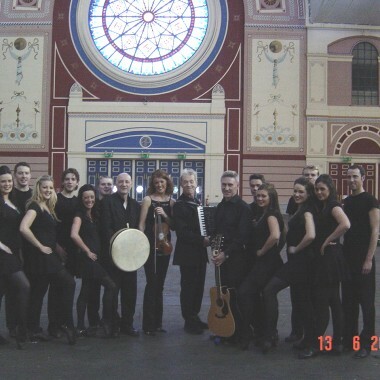 In fact the team we created were, in the most part, ex-Riverdance or Lord Of The Dance performers, a few still performing with these shows at the time! We created original pieces of choreography – based on traditional Irish dance forms but with a modern feel – using equal numbers of girls and boys, soft and hard shoe. We ended up with a dynamic, fast moving show which had a duration of approximately 20 minutes, although longer (and shorter) durations could easily be organised. This show was put on at Alexander Palace during several days in June 2005 for a delegate of 2000 Chinese business people, and received a rapturous reception on each day. Right from the start we envisaged that there could be an element of audience participation, with a number of the audience coming up to the stage and joining in the dance routines, with predictably hilarious results! This was kept quite separate from the ‘show’ which was not compromised at all and performed uninterrupted, but provided some light relief to the rather more serious, indeed studious atmosphere of the plenary and detailed sessions taking place throughout the several days. We used 12 dancers and four live musicians for these shows, although a larger or smaller group would be possible, depending on budget and circumstances.